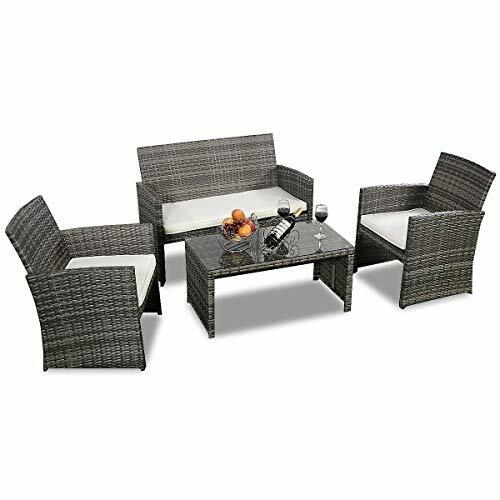 【Sturdy & Attractive】 Constructed from strong powder coated steel frame and commercial grade hand woven weather-resistant PE rattan wicker in a gradient shades of coffee creating a whole new look and feel for your patio set. 【Upgraded Comfort】 Comestible lofty sponge padded seat cushions for more comfort and relaxation. 【Tempered Glass】 Table with removable tempered glass adds a sophisticated touch and allows you to places drinks, meals, or any other decorative items on top. 【Easy to Clean】 Removable seat cushions with 200g zipped polyester cover for easy cleaning; Tempered glass on the table adds more convenience to clean after use. 【A Great Addition to Any Compact Space】 Great buy for a small deck, patio, balconies, apartment, terrace, breakfast nooks or pool side.